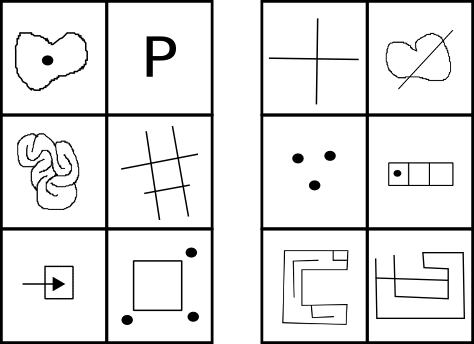 Bongard problems are a type of puzzle invented by Russian computer scientist M. M. Bongard, intended as challenges for pattern recognition algorithms. Regardless of the possible relevance to computer science, they are much fun simply as puzzles created by people for other people to solve. They were popularized in the Gödel, Escher, Bach book and Hofstadter himself designed many Bongard problems. Harry Foundalis has several pages dedicated to these problems, with an extensive index of example Bongard problems. The idea of a Bongard problem is the following: given a set A of six figures (examples) and another set B of six figures (counter-examples), discover what is the rule that the figures in A obey and figures in B violate. 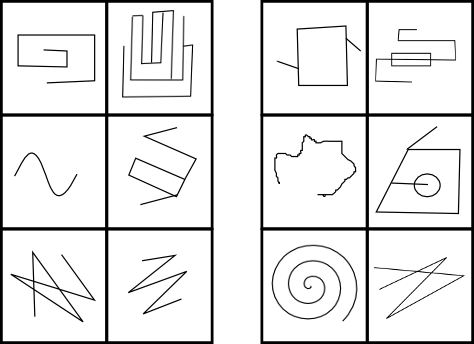 Inspired by these examples I tried my hand at making some Bongard puzzles myself. The modest result is below. 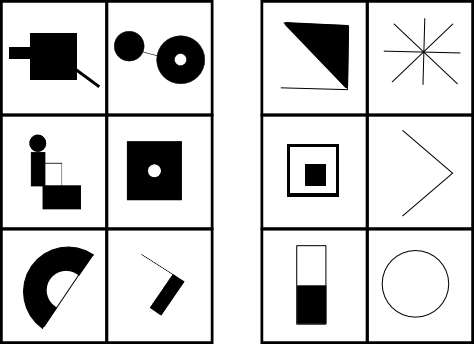 If you can solve them, leave the answer in the comments. 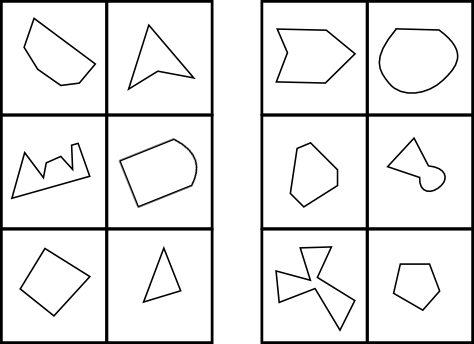 For puzzle 1 all shapes in A have a single bounded interior, while shapes in B have zero or multiple bounded interiors. Haven’t a clue about the others. @John: correct! I added the solution to the others via the small link in the end. I love puzze 2, very clever! Hm. #2 is, indeed, a nasty little bugger. Well done. #4, however, is… well. I’ve read the explanation, and read it again, and tried visualizing what you mean, and it’s not working. I think this one might require too much external knowledge. Solution to #4 would better be described as “there is a side so that each line perpendicular to that side crosses the figure only once”. Sorry, should be “twice”, not “once”.